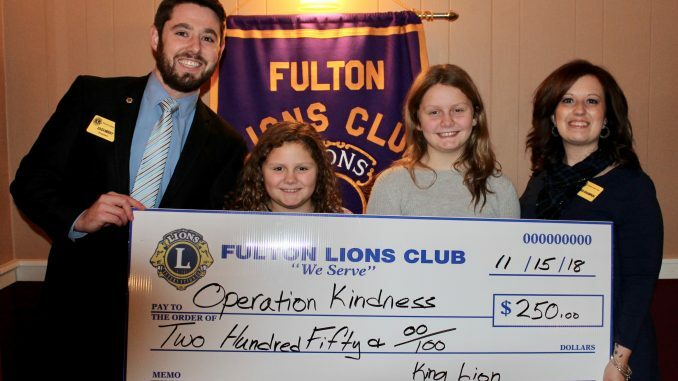 FULTON – The Fulton Lions Club made a $250 donation to Operation Kindness, the brainchild of Autumn Barrick, a 5th grade student at Lanigan Elementary. In addition, James Karasek, advocacy manager, ARISE Oswego County office, made a presentation on diabetes at the club’s November meeting. 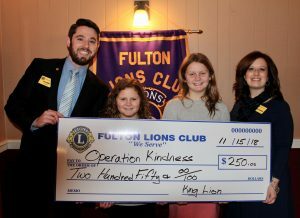 The Fulton Lions Club made a $250 donation to Operation Kindness, the brainchild of Autumn Barrick, a 5th grade student at Lanigan Elementary, second from right. Joining Autumn are, from left: Zachary Merry, Fulton Lions president; her sister, Addison Barrick; and Lion Melissa Champion, who brought the program to the Lions club. Operation Kindness, a free toy store, now in its second year, provides Christmas toys and gifts at no charge to those who need them. It runs from 9 a.m. to 4 p.m. on Dec. 1 in the community room of the Fulton Municipal Building, 141 S. First St. When she was in 4th grade, Autumn wanted to bring Christmas to all families in our community and Operation Kindness was born. Each shopper may take two new/gently used gifts for each child in their home. In addition to toys, there will be free drawings for popular toys and there are also some winter coats available. 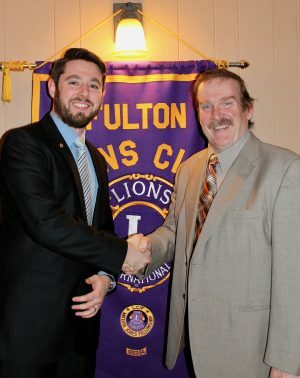 Fulton Lions President Zachary Merry, left, thanks James Karasek, advocacy manager, ARISE Oswego County office, for his presentation on diabetes awareness and treatment at the club’s November meeting. Karasek discussed his personal experiences with diabetes, as well as the ARISE Diabetes Self-Management Program. It’s open to people with disabilities and type 2 diabetes. Topics include: techniques to handle fatigue, stress, pain and emotions; improving strength and endurance; healthy eating; proper monitoring; appropriate use of medication; skin and footcare; and questions to ask your healthcare provider. Karasek can be reached at (315) 324-4088, ex. 206, or at. The Fulton Lions Club provides financial assistance for those in need of eyeglasses, eye exams, and hearing aids to residents in the greater Fulton area. For more information, visit www.fultonlionsclub.com, or find them on Facebook under Fulton, NY Lions.